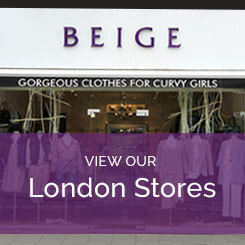 Beige Plus specialises in plus size fashion and we understand that when it comes to swimwear cut and quality are key. Our creative director Leanda Walters is a plus size woman with thirty years experience dressing other plus size women. It's her unique eye and her personal understanding of the plus size woman's specific needs that makes Beige Plus the go to boutique for women from size 18-28 who demand quality and who refuse to settle. Embody beach-body confidence with our stunning collection of plus size swimwear. When it comes to swimwear it's all about finding the right style for your body shape and because every body is different our stylists are on-hand either online or in-store to help you find the perfect swimsuit for your shape. For advice on picking the perfect swimming costume for your shape contact us on 0208 455 0005. Available in sizes 16-28, you can also shop online or in store at one of our London boutiques.